Where was I? Oh yes. Later on, when I found out to my horror (about the lies, not the fact that people in Africa were eating all along) that not only does Ethiopia have food, but a national dish, I decided to add it to THE LIST. Serves 2. 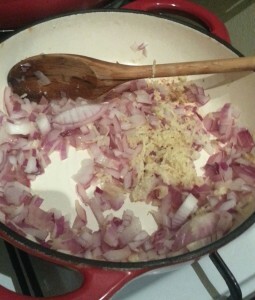 OK, so you’ve noticed the oddly large amount of onion. Some recipes I found said to use 2 per person, others just had a few thrown in. I went with one onion per person. Dice onion and smoosh the garlic. Add, along with the grated ginger to a pan (with a lid) on medium heat. Add a slug of olive oil and stir. Put the lid on and reduce heat to low, for about 20 mins. In the meantime, dust the chicken in cardamom powder and salt. After 20 mins, the onion mix should smell amazing, and look like purple/brown sludge. Awesome! 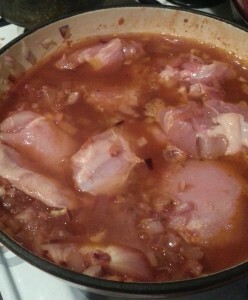 Add in the chicken, red wine, tomato paste, stock and berbere. Reduce til the gravy is thick. 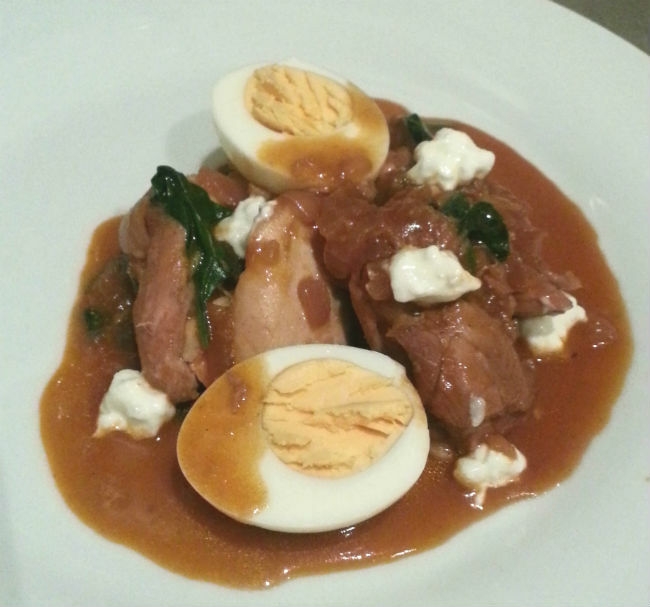 Add in your handful of greens if you wish, once wilted serve with dollops of cottage cheese and a boiled egg each. If you can’t find berbere spices, make your own from this recipe – although if you can’t find all these, just use chilli powder. This was very hot, and it needed to be, as the onion was very strong. One of the few dishes that more chilli will actually make better. Also recommended for breakfast the next day!